Has this happened to you before? You’re out shopping and all of a sudden, you spot a pair of retro boots that remind you of your childhood. The next moment, you find yourself spending a considerable amount of money on something you didn’t even plan to buy. For decades, various brands have employed nostalgia as one of the most persuasive marketing and branding strategies. Similarly, digital marketers can use it to make more impactful online campaigns and better-converting business websites or online stores. Given the findings of professor Vohs’ research, nostalgia could play an important role in website design, so we decided to discuss how it could effectively be used for this purpose. In order to invoke nostalgic feelings and emotionally engage their audience, online businesses need to do a comprehensive market research. Only by getting to know your target audience, will you be able to adapt your digital strategies to their needs and expectations. Given the number of the Millennial consumers, many global corporations have decided to elicit the feeling of 90s nostalgia in their latest product lines. Namely, one of the first companies to resort to this strategy was Coca-Cola. On the behest of a Millennial-led digital fan community, the company decided to reintroduce their long-forgotten Surge, a citrus-flavoured soft drink that was discontinued 12 years ago. Apparently, the results were quite impressive. At the moment, Surge is believed to be more popular than ever, taking pride in the jaw-dropping number of 273,000 Facebook followers. While Coca-Cola is bringing Millennials back to the 90s, some brands are using nostalgia to describe their evolution over time. Some of them have built their philosophy upon the fact that they grew and developed together with their consumers. A perfect reference to this phenomenon is the latest Microsoft Internet Explorer’s video. Concluding with “You grew up; so did we” statement, the video became viral among the Millennial audience and reached over 7 million views on YouTube in just five days. Another compelling form of successful website personalization is highlighting consumers’ most significant memories, photos or events. This tactic serves not only as a nostalgic feedback, but also as a sentimental reminder that it is rich history that connects a particular brand and its users. Similarly, Everpix, a photo storage app that used to be quite popular before it was discontinued used nostalgia in order to keep up with the competition and keep their users engaged. Their feature Highlights 2.0 used to display photos from previous events to encourage users to get back to their older photos and use the app longer. The similar feature was later introduced by Facebook, which was the only big network to experience a drop in active usage in 2014. Namely, the studies show that only 28% of young Facebook users spend time on the network all the time. 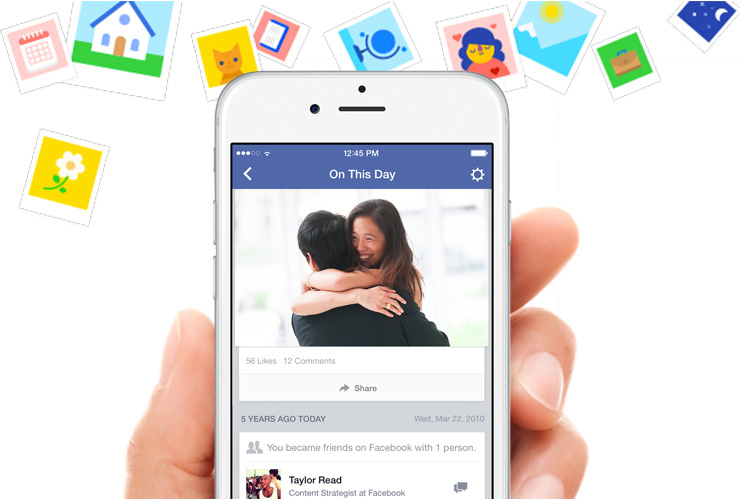 By launching “On This Day” feed of the memories the users posted to their timeline on a given date in the past, this giant is trying to inspire young generations to use it more actively. The Nostalgia Weakens the Desire for Money research shows that the majority of the customers are prone to spending and donating more when they recall a nostalgic event. This phenomenon has inspired numerous companies to employ solid nostalgia marketing. The reference to this form of customer familiarity is Coca-Cola, which has become synonymous with the most appealing vintage digital marketing campaigns. Over time, it has released a wide array of vintage bottles, ads, posters and songs that invoked the positive reactions in both young users and adults. The audience has always been attracted to the companies that stand for a long tradition, compelling service and confidentiality. One of the crucial aspects of building such a reputation is creating a memorable, versatile and simple logo. Through its design, it will soon become the key element of your brand, reflecting its identity, values and principles. During the process of rebranding, the majority of companies tend to modify their logos and adapt them to the modern market needs. Given the examples of internationally recognised corporations like Coca-Cola, Apple or Windows, it could be safely claimed that changing a logo can sometimes be a highway to the growth of business and the number of customers. On the other hand, it takes decades for consumers grow to recognise, like and trust a specific brand just because of its recognisable logo. Furthermore, studies have long shown that people are likely to buy a product by a brand they are familiar with, even if it costs more than that of a competitor. This is exactly why numerous companies tend to revert to their old, initial logos in order to evoke the familiar feeling of nostalgia in their target audience. One of such examples is J.C. Penney. Namely, during the process of rebranding, the company failed to successfully launch its new, square-cut shape logo. After facing notable marketing failures, stock drops and the loss of $552 million, J.C. Penney decided toplay one last card and entrust its future to a nostalgia-induced campaign, based on returning the previous logo. According to the studies, only three days after the classic logo was regained, Penney made a notable progress, which was best seen in its positive sales and raised shares. Therefore, for businesses that heavily rely on online channels to make the profit, coming up with a creative campaign that evokes nostalgia should probably be the next marketing focus. Welcome to exceptional service and great hosting products. We’re a homegrown team of experts who love helping small business succeed online.